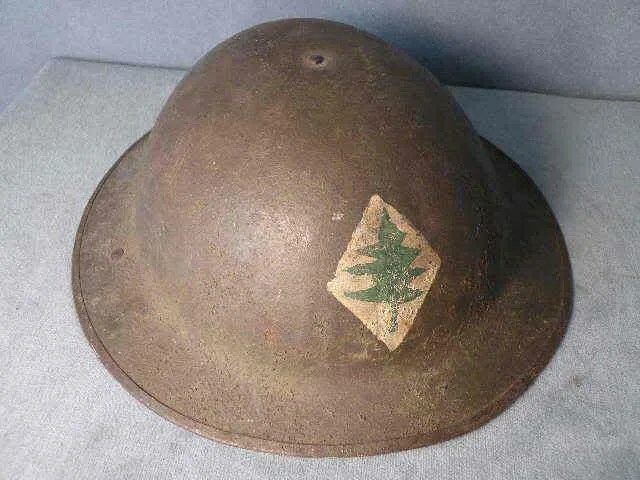 In September, 1917 a press conference of Boston newspaper reporters was called by General Clarence Edwards to determine a nickname for the 26th Division which had been newly-formed from New England National Guard units. 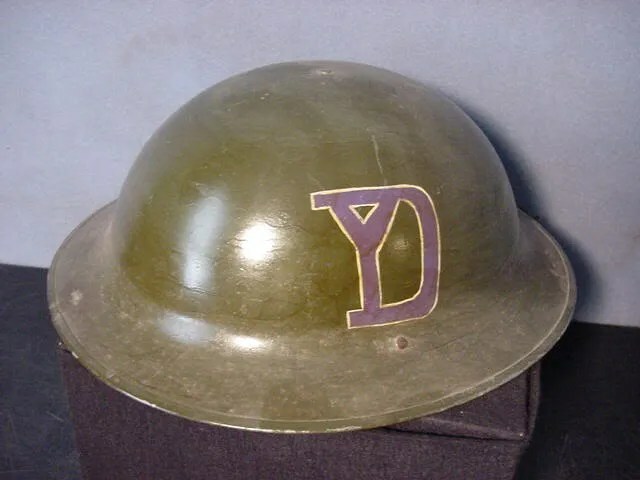 One reporter (Frank Sibley of The Boston Globe) suggested to “call it the ‘Yankee Division’ as all New Englanders are Yankees.” The “Yankee Division” was thus adopted as the nickname of the 26th Division with a “YD” monogram as its insignia. 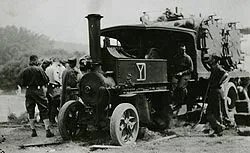 The “Yankee” Division was the first to copy the French and British system of branding all unit vehicles with its insignia. 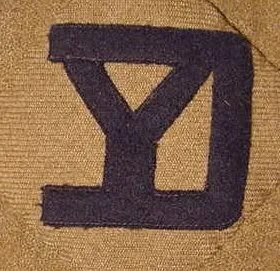 All mules and horses were branded with the “YD” monogram long before the use of Divisional insignia was mandated in the AEF. 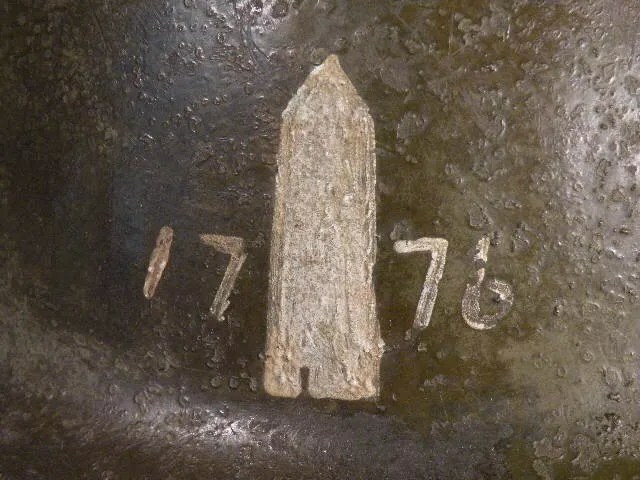 Motor truck units of the Division also painted sub-unit emblems such as anchors, eagles and replicas of the Bunker Hill Monument (located in Sam’s home neighborhood and pictured here) on their vehicles. 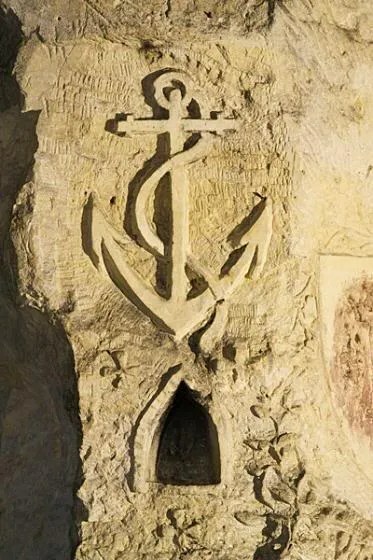 These emblems were also the subjects of cave art carved on the limestone walls of quarries in the Chemin des Dames when the troops of the 26th Division first entered the front lines in 1918. 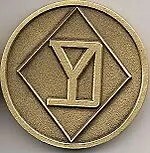 In response to this directive, the shoulder patch for the 26th Division was submitted for approval on October 23 consisting of the “YD” monogram in blue cloth matching the color of the French Army uniform on a diamond background of olive drab. 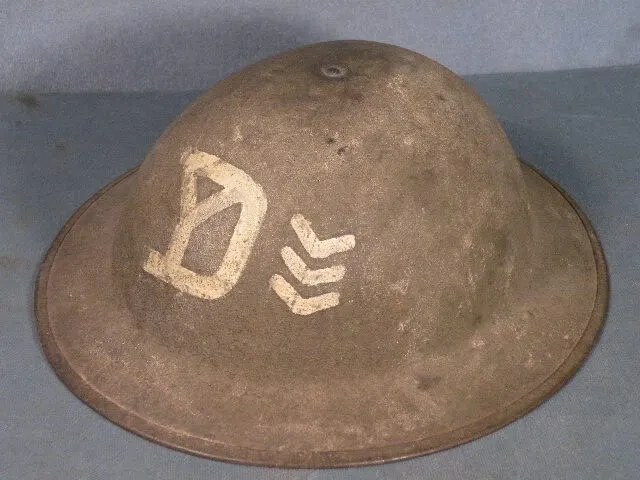 The original design was authorized with a subsequent change of the monogram’s color to dark blue. 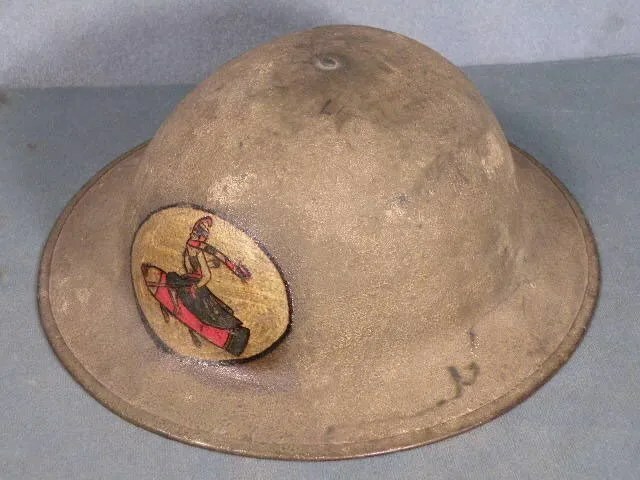 The wearing of this shoulder patch was made compulsory for all men of the 26th Division after November 29, 1918 in orders from First Army Headquarters. 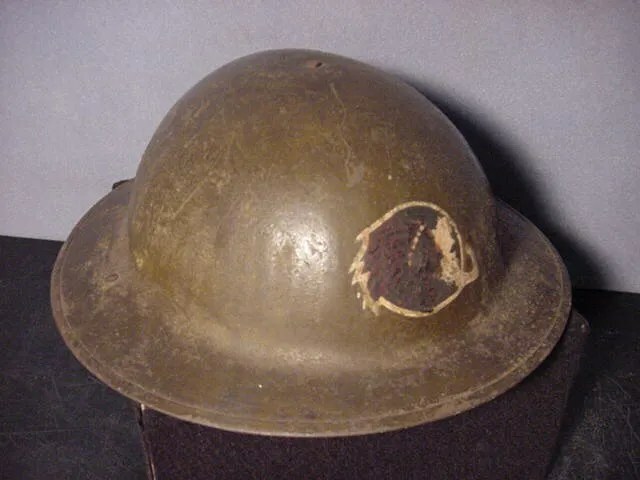 The first shoulder sleeve insignia (such as that pictured above) prior to the Second World War frequently had a make-shift appearance and were manufactured of wool felt-on-felt or other cloth in muted colors. 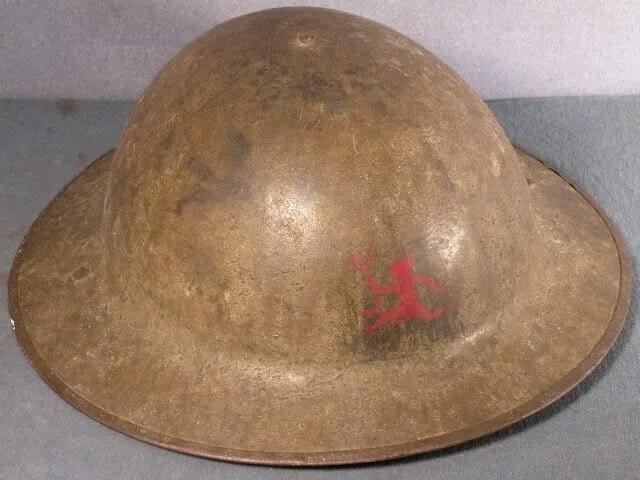 Many of these were very crudely made in the field. Others were embroidered or machine-woven. 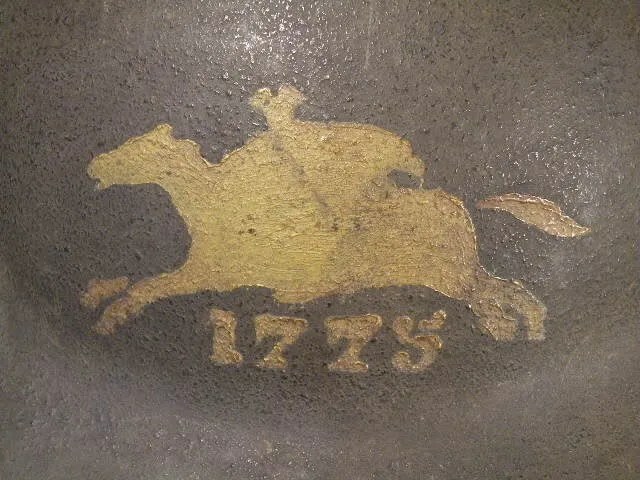 Later insignia would be mass-produced using full embroidery with a wide range of colors. 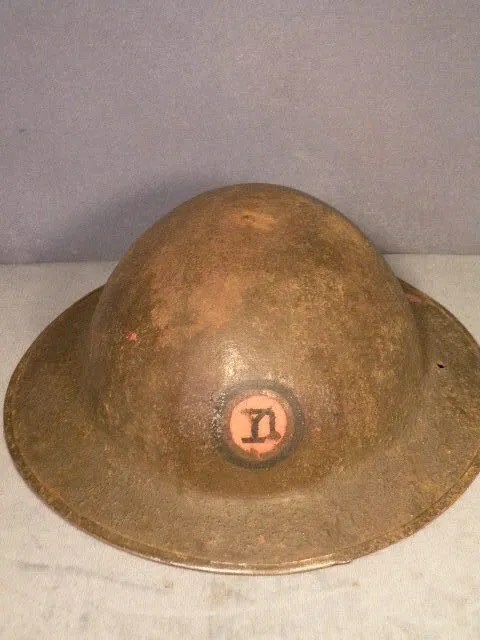 Photos of vintage 26th “Yankee” Division helmets courtesy of Bay State Militaria and Antiques. 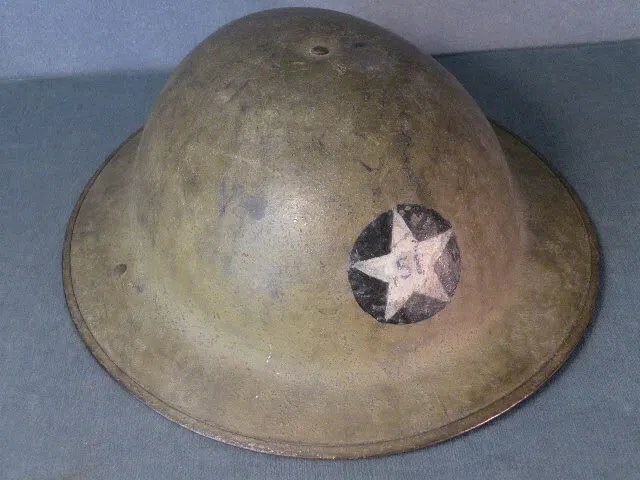 Visit this link to browse and procure distinctive and rare American militaria. 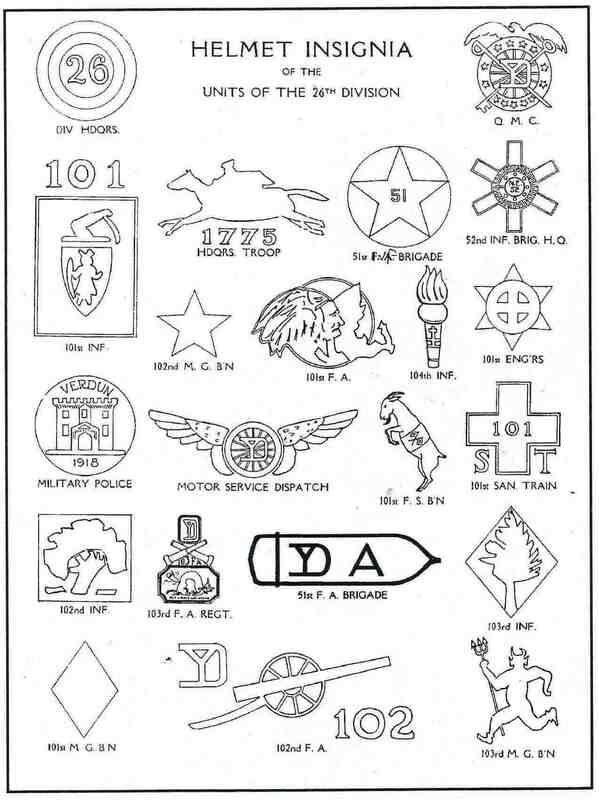 In regards to the YD patches, the first ones available to the units in France were crudely made in France by the soldiers themselves or local seamstresses. I had the honor of interviewing a member of Co.K, 101st Infantry several years ago. 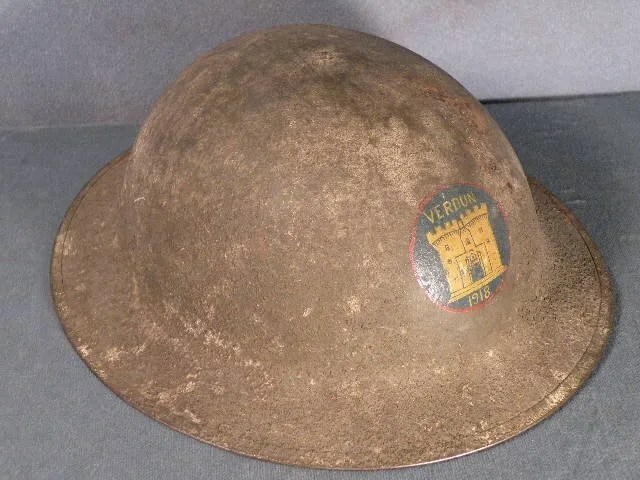 At the time he was 102 years old and still recalled clearly much of the war in France. He related to me the story of “Cootie Mary” and how she was the local elder seamstress for his group of fellows and she did the sewing on of the patches when they were approved. She also did repairs on socks, etc. 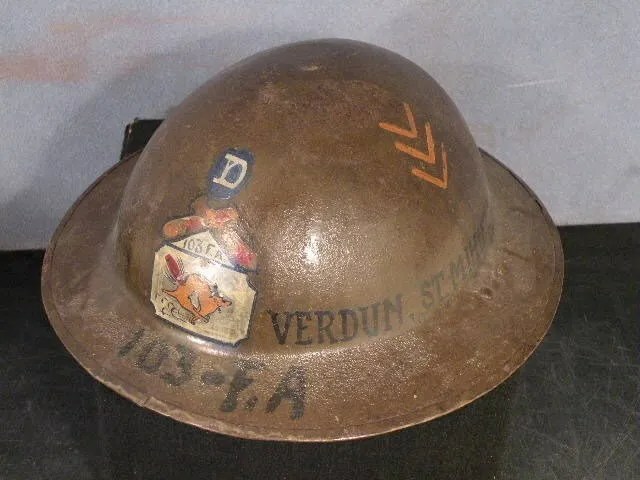 One can only imagine how she got that nickname, knowing that all the soldiers of the YD were inflicted with body lice for most of their time in France. Uniform seams were ripe places for lice. 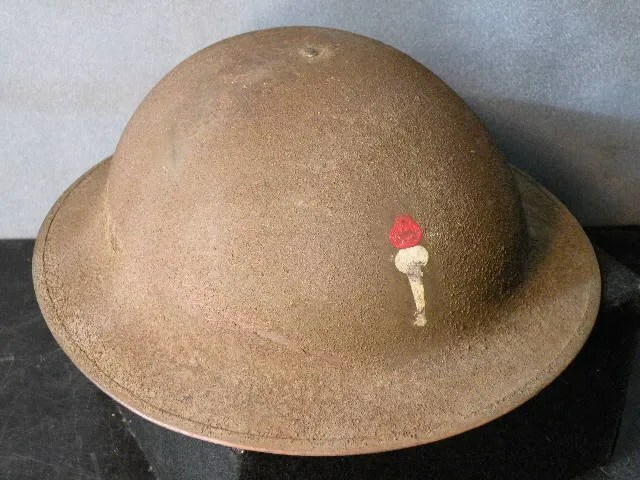 Troops of course were officially deloused at irregular intervals during the war, but “Cootie Mary” probably had no access to this process. My name is Doug Ely. I live in Palm Bay Fl. 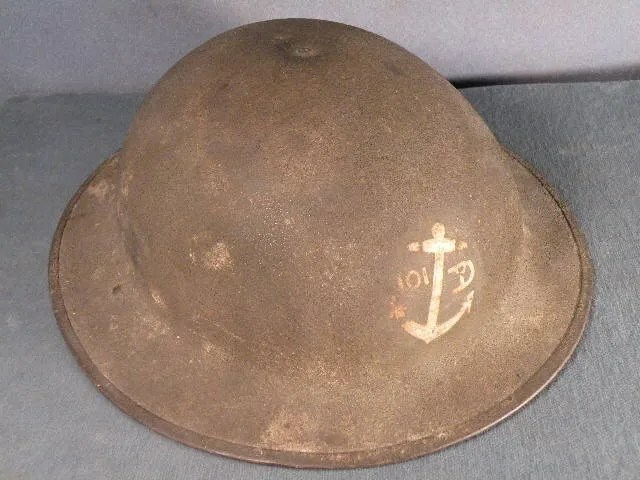 I am trying to do research for the family of a ww1 vet by the name of Edmund Merchant. I was told he won the purple heart & silver star for actions in France. 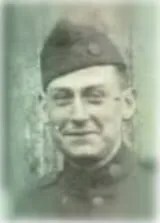 I would like to know where he is buried and I do believe he was in the 26th Yankee div. I do not know his rank or unit branch. He was from Everett Mass. The family would love to have any info available. I do not have a unit history with names. Hopefully somebody out there could help us out with this. Thank you very much. Looking forward to hear more about Edmund Merchant. Nice website. 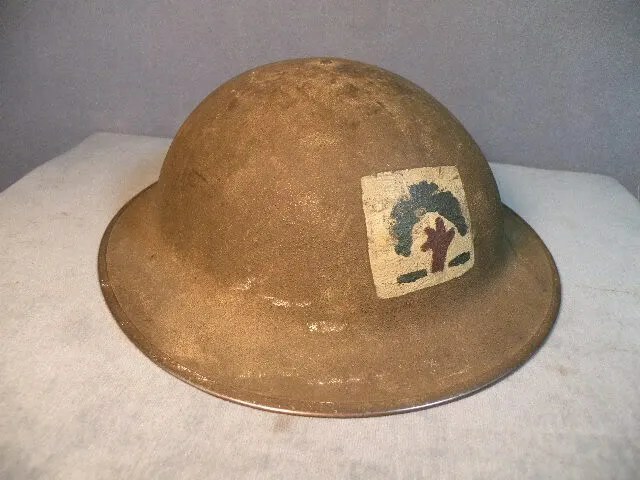 I am a long time collector of 26TH Division material and you have some great items shown here. I enjoyed your effort and insight to shed light on this under appreciated unit. 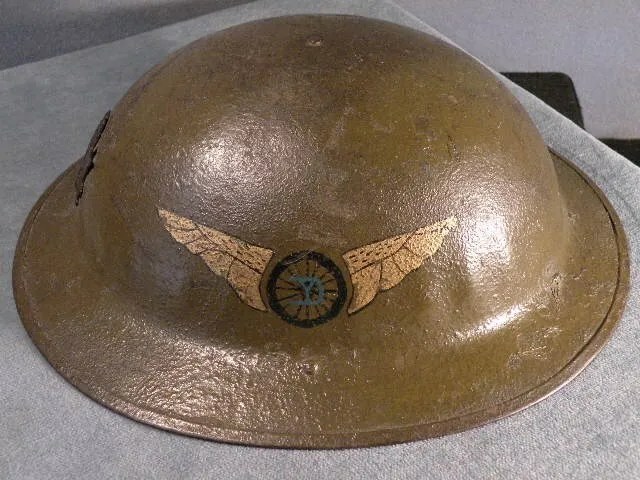 Hi, my Great Uncle Pvt Manuel Martin was a member of Co G 104th US Infantry AEF. 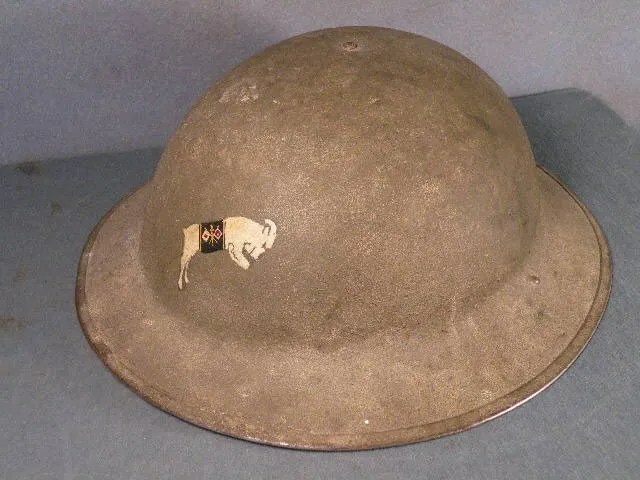 He was KIA in Apremont France in April, 1918. 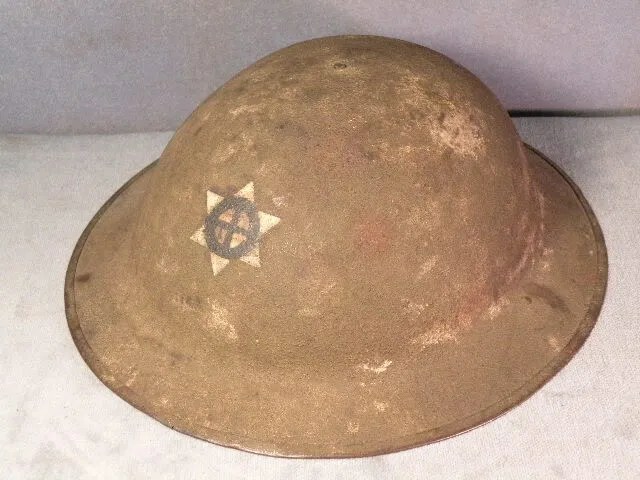 I wanted to know if anyone had any information on this or the family etc. He is a native of the Azores but lived in Lowell MA. I would greatly appreciate your forwarding the info to my email address attached to this post. Hello! 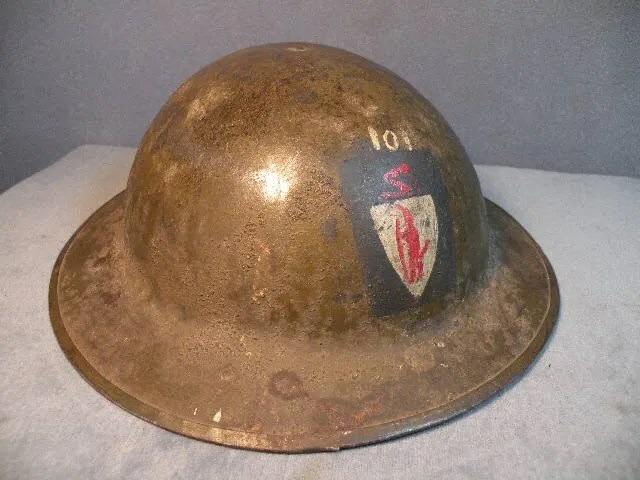 I have a helmet identical to the one photographed on this page entitled 102nd Field Artillery Regiment – can someone tell me is this was used in WWI and if so in what country was it worn during the war? 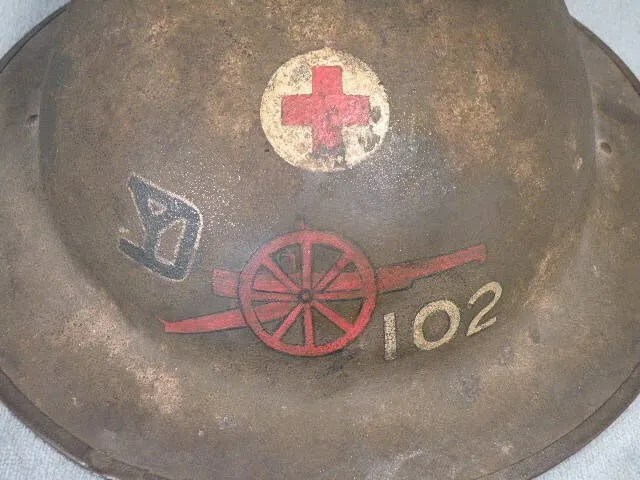 It has a red canon, the YD and number 102 on it. 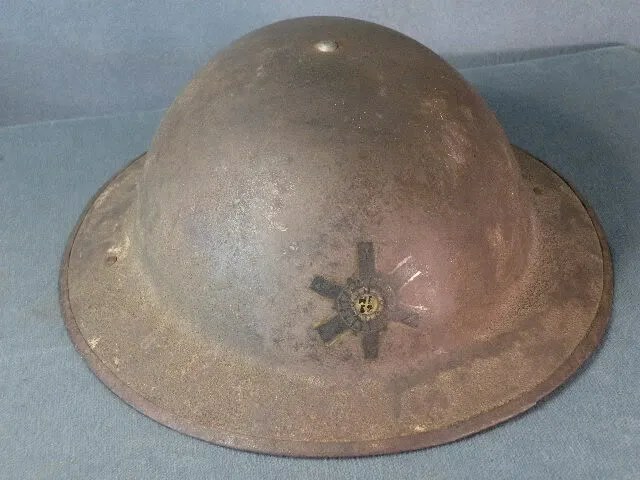 What year range would it have been used during the war? 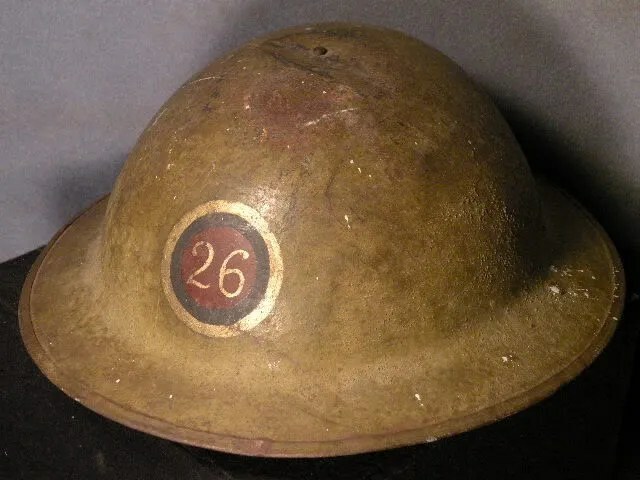 Is this part of the 26 division and not sure what that means. 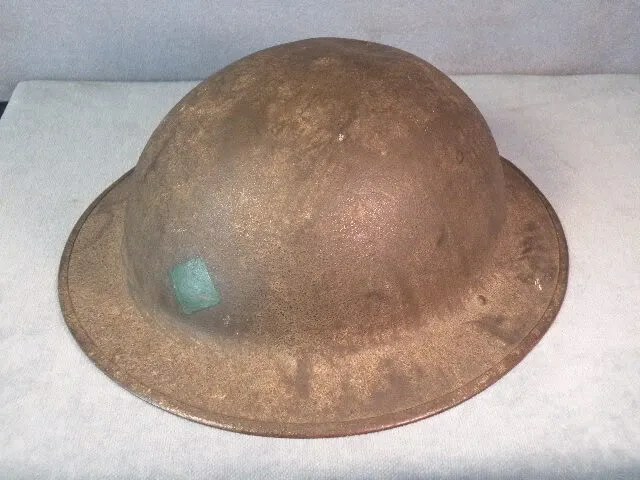 Thank you for any history can give for a description of this helmet collected by my father. 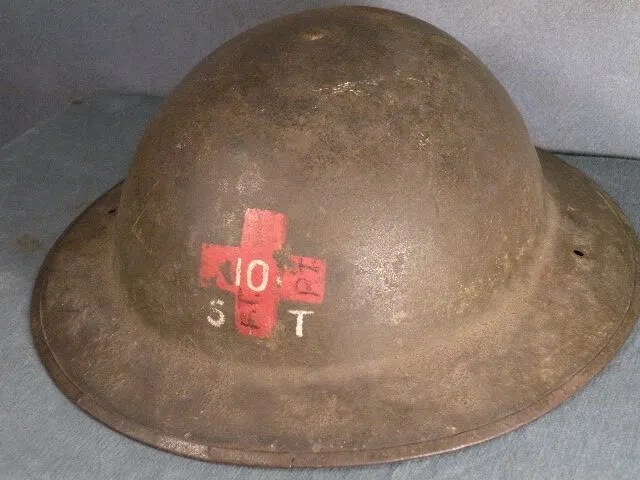 Was told it is a WW1 Yankee Division 102 Auxiliary. 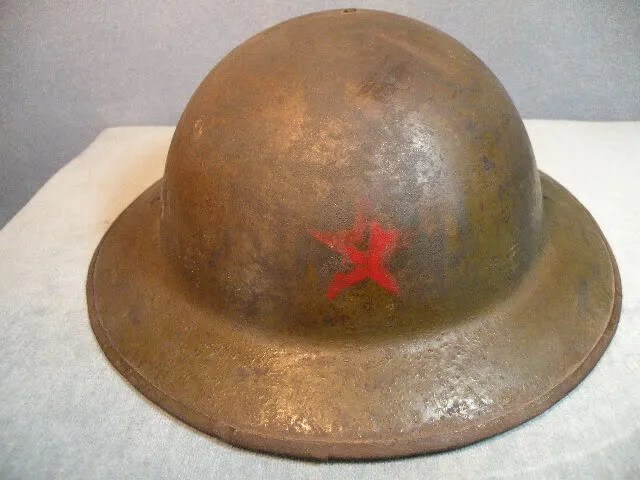 Would anyone know the approximate value of this hat and how highly collectible it is? Thank you very much. 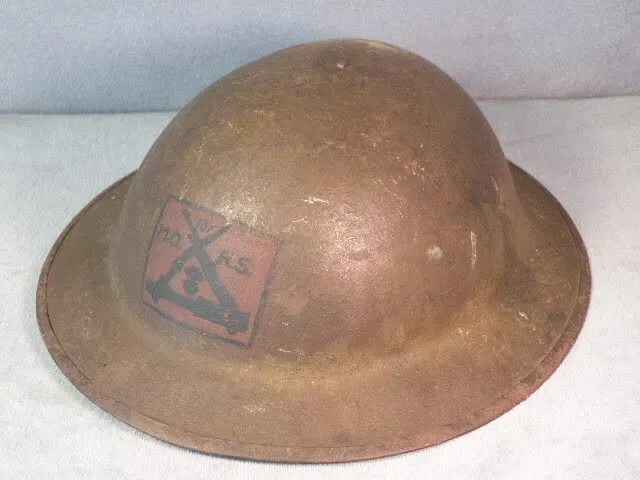 Hi,My name is Howard Matteson Clark and my grandfather was in the Yankee Division in was in Nov 14 1917 to Aug 14 1919 if there is anyone out there that can help me get more Information of were he was and any Medals he got I would greatly be thankful to you and God bless you and your family. 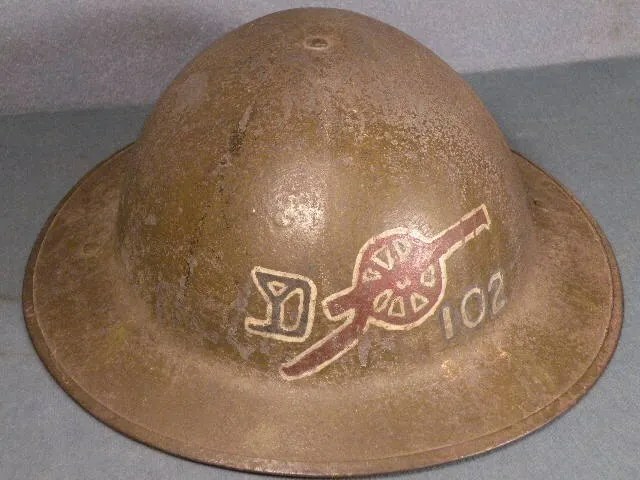 Yours Howard Clark Oh his name was Howard Roger Matteson from Cheshire CT.
Hi – my great grandfather was in the Yankee Division – 102nd Field Artillery, Battery D. Would love to know if anyone has any information about the 102nd FA. I have a book on the History of the YD. My Dad received it on the 50th anniversary of the Division.